Strength - 5. Rich and full-bodied. Suitable for all coffee makers.An Iconic Italian coffee with an unmistakable aroma to kick start and energise your day. A selection of Brazilian Arabica beans and Robusta mainly from Africa and South East Asia. The traditional recipe, for true coffee connisseurs. Strength - 5. Rich and full-bodied, with notes of chocolate. Suitable for all coffee makers. Italy's favourite coffee Lavazza is synonymous with quality coffee all over the world, this comes directly from over a century of passion for coffee, experience, research and innovation. Make the Perfect Coffee The Traditional Italian way Stove top espresso pot Follow manufacturer's instructions for an authentic Italian experience. 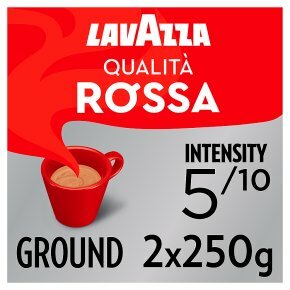 Cafetière Add Lavazza coffee to a warmed cafetière, 2 rounded dsp for a 3-cup cafetière (5dsp/8cup, 8dsp/12cup). Fill with hot, not boiling water to an inch from the top, stir, replace the plunger and allow to brew. When you see the coffee grinds begin to settle (approx. 3min), push plunger down slowly and serve immediately.